The TI5 Grand Final is barely over and speculation as to the status of team rosters has already begun. It was rumoured that the roster lock-in date for the Fall Major would be September 1st, according to ChuaN, so it is going to be a hectic few weeks for all the teams, as they consider where their best chances lie for the upcoming season. This semi-official transfer window is brand new to DOTA 2, so almost everything is subject to speculation until proved or disproved. We will compile all the potential changes and rumours here so you can keep updated with all the teams as they move towards the Majors. The biggest rumour to surface comes from Vitalii 'v1at' Volochai, a Russian caster/personality who has very close ties to the CIS DOTA 2 region.Team Empire originally tweeted asking about people's thoughts on the upcoming transfer period, which usually happens after The International. With the new Majors system being introduced by Valve, the roster changes are going to be particularly important. Although v1at admitted that the changes are by no means accurate (he later tweeted "I tried"), he is known for having good information on the European DOTA 2 scene.He speculated that Team Empire offlaner Maxim 'yoky' Kim will leave his team, Gleb'Funn1k' Lipatnikov and Ivan 'Artstyle' Anotov will leave Na'Vi, Vladimir 'No[one]' Minenko and Pavel 'pasha' Hvastunov will leave Vega Squadron, Virtus.Pro will stay stable after their strong TI5 run and HellRaisers will pick up 2 new players after the team parted ways earlier this year. Another source close to the CIS DOTA 2 scene has suggested that the new Na'Vi lineup will consist of: Danil 'Dendi' Ishutin, Alexander 'XBOCT' Dashkevich, Akbar 'SoNNeikO' Butaev, yoky and former Kompas Gaming and Yellow Submarine player Andrey 'PSM' Dunaev.Despite the rumours being speculation on v1at's part, they might be a good guideline to go by going into the reshuffle over the next 20 days or so. The Cloud9 manager Conrad 'quantumpope' Janzen has confirmed through his ask.fm page that Cloud9 will definitely be undergoing some roster changes in the forthcoming weeks. He didn't give any specific player movements, but said that both his team and Team Secret will "probably" be changing. When asked "On the scale of 0 to 10, how would you rate C9's chances of roster change?" he replied simply: "10/10". Similarly the question "Will C9 have a roster change ?" was given the brief answer "100% chance". However, when asked if Johan 'N0tail' Sundstein and/or Jacky'EternalEnvy' Mao are getting kicked from the team he responded that: "Nobody is getting kicked". Given that he has confirmed that nobody is getting kicked from the current roster, but that there will definitely be changes, he is heavily implying that one or more of Cloud9's current roster is considering leaving the team and will be replaced by other players. Cloud9 manager quatumpope also provided some insight as to the status of Team Secret on his ask.fm. When he was asked if Secret's roster was shuffling he only said "Probably", but when he was asked specifically about Secret player changes he said, "Yes. Who and where, I do not know". What is for sure is that the current Team Secret offlaner Ludwig 'zai' Wahlberg will most likely be taking a break from competitive DOTA 2 in order to go back to school and study. In an interview on DotaBlast he said, "It’s hard to say. Even if we play well [at TI5], we may see some change. I may take a year off after TI". He continued: "I’ll focus on school for like 9-10 months and then come back to Dota". As for the other players on the team there has been nothing to really confirm changes other than some Twitter antics from Gustav 's4' Magnusson apparently deleting all mention of Team Secret from his account, which he later claimed was an accident. After a dissapointing performance in the NA TI5 qualifiers with Mousesports, Dominik 'Black^' Reitmeier is maybe considering moving back to Eastern DOTA 2. 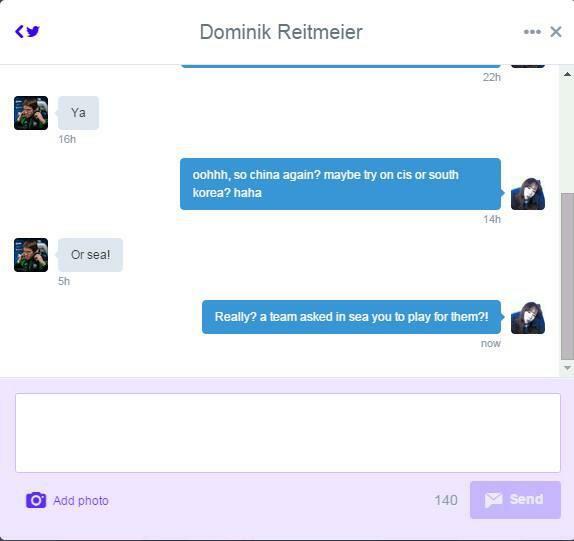 In a picture of a private message on Twittter the German carry player suggested that he might be going to an SEA team after their recent success at The International.